In this article, we will explore how we can implement Separation of Concerns (SoC) principle in a SharePoint Framework solution. In this article, we will explore how we can implement the Separation of Concerns (SoC) principle in a SharePoint Framework solution. Separation of Concerns is a design principle for separating our program (or solution) into a distinct section, wherein, each section addresses a separate concern. 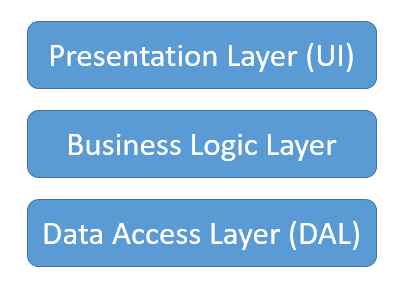 A code is split into sections with each one responsible for its own functionality (e.g. business logic, presentation logic, user interface, etc.). Each section is independent and does not need to know the internals of other section. They only need to know how to communicate with each other by passing a certain information and get the desired result. In an SPFx solution, we can refer to each section as a Service. In this article, we will reuse React Based OrgChart implemented in the previous article. Download the source code from the previous article to get started with implementing SoC. The React component OrgChartViewer.tsx at \src\webparts\orgChartViewer\components\ has all the data access, business and presentation logic. We will start implementing by services to develop an independent section. 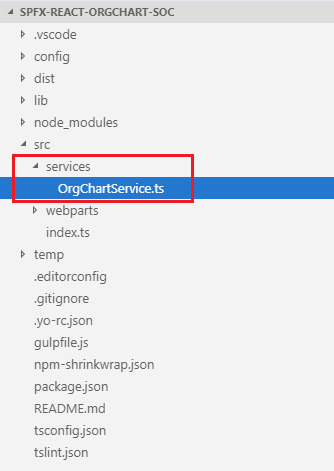 Under src, create a folder named "services". Add a file OrgChartService.ts file under it. What is ServiceKey and ServiceScope? These classes allow for implementing the dependency injection. Instead of passing a reference to single dependency, we can pass scope as an argument to section and section calls consume() method to call the needed service. The below line of code declares the service key. When the web part is running on local SharePoint workbench, the mock data service can provide the mock data to the web part. Open web part class OrgChartViewer.tsx under “\src\webparts\orgChartViewer\components\”. Update the class to consume the implemented service. // Mapping to be used when webpart runs in SharePoint. // Webpart is running in the local workbench or from a unit test. Edit the web part and add the list name (i.e. OrgChart) to web part property. The web part should display the data from a SharePoint list in an organization chart. Click on the nodes with URL to see test the page navigation. With the implementation of Separation of concerns (SoC), all sections are separated. The code is easier to maintain and upgrade without touching other sections. ServiceScope helps to build SoC in SharePoint Framework solutions.